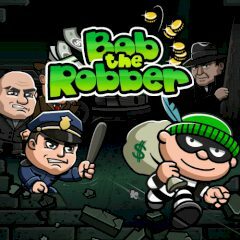 Bob is a young robber that above all wants to set justice. Can you help him investigate a mysterious case and find out what the real thing is? Gather some information and build the picture! Help Bob during his investigation and find all clues in various buildings. Break the alarm system and enter the chamber, hide in the shadows if you don't want to get caught. Avoid being seen by the cameras and collect money from closets. Make sure nobody sees your presence in the building until you escape it.